There is a large need for custom steel stairs in Illinois. Large corporations require steel stairways for both external and internal use. Many industrial companies rely on strong and durable custom steel stairs for completing their day-to-day operations. TITAN Industries, Inc. has extensive experience in planning, design, and fabrication of custom stairs for organizations of all sizes, even for residential design. If you are looking for a steel fabricator in Illinois who can fulfill your custom steel stair needs, call our office at (309) 440-1010 today! Commercial buildings that are multi-story often require steel staircases either on the interior or exterior in order to meet strict safety requirements. TITAN Industries Inc. knows how to combine functionality and design to achieve an attractive steel stair solution for your business. From corner stairs, straight stairs, or spiral designs, our team will work closely with you to meet your needs. 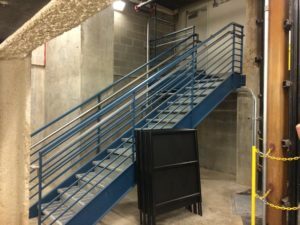 Depending on your industry, you may rely on stairs to keep your employees safely out of harm’s way while being able to access integral areas of your building. Our industrial steel stairs are a great addition to your building. Our quality steel is created perfectly suited to your industry. Talk to one of our steel fabrication experts to plan your custom design. There is a unique and clean ambiance that comes from residential steel staircases in residential settings. Top modern designers are turning to steel for a fresh and clean look for their homes. If you would like to know how we could design a custom residential staircase in your home, give us a call. If you would like more information about custom stairs in Illinois, Contact TITAN Industries, Inc. Call (309) 440-1010 for pricing and a full products list today!